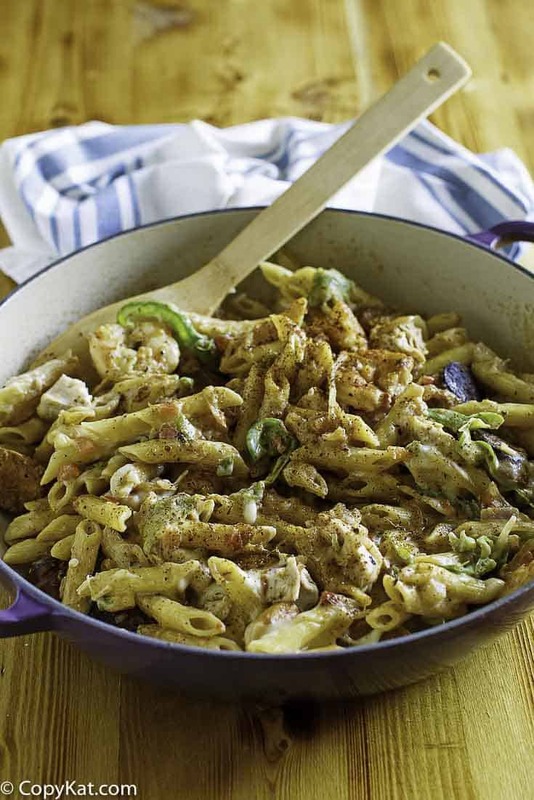 Cheddars New Orleans Pasta is a favorite Cajun-style pasta dish. It is so easy to make, and you can put together this dish at home. It’s the perfect way to feed a large gathering. If you have never been to Cheddar’s their restaurant is amazing. They do scratch cooking, and their food is such a great value. It’s the perfect place to go out with a gathering of friends, or even to take the whole family. Their menu is diverse, you can find something for everyone at Cheddars. One of the most-loved dishes is the Cheddars New Orleans Pasta. 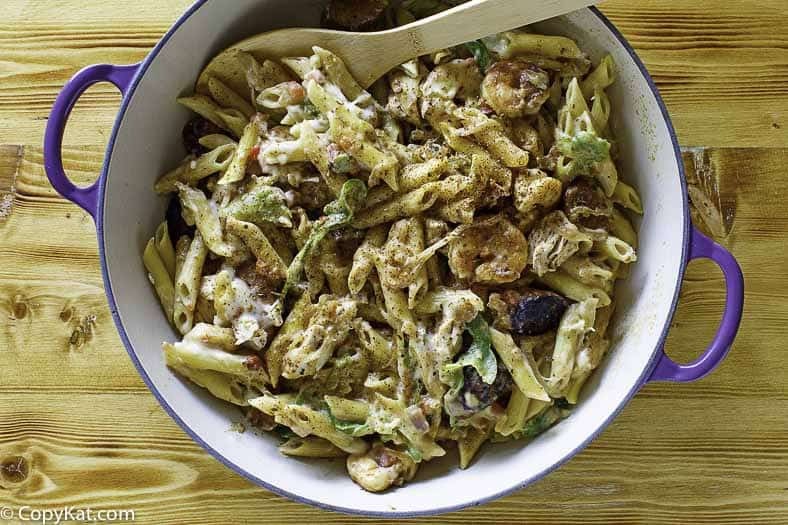 This pasta dish is a medley of flavors, shrimp, chicken, smoked sausage, peppers, onions and penne pasta tossed in homemade Cajun Alfredo sauce. This complex tasting dish is perfect for a weeknight dinner, as it can really feed a crowd of people. You may even want to pair this pasta dish with garlic bread for the restaurant experience. 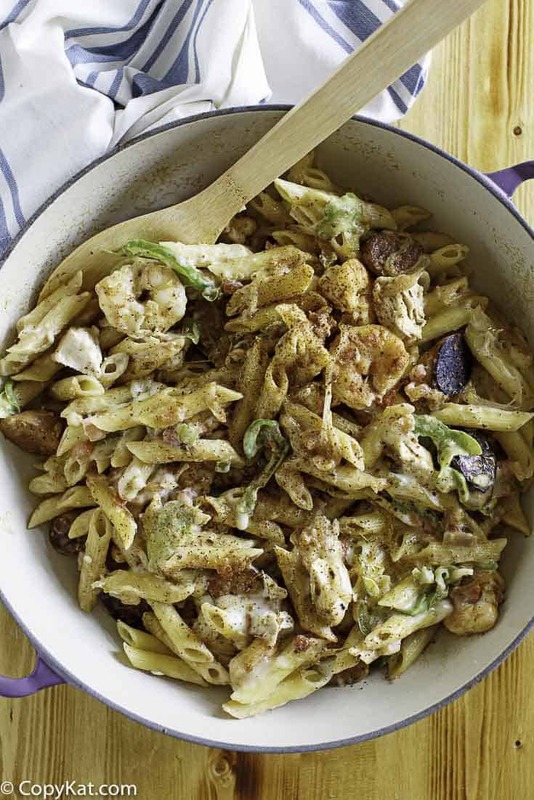 This recipe features a spicy homemade Alfredo sauce, and it has sausage, chicken, shrimp, and an assortment of fresh vegetables. You could modify the recipe by omitting shrimp and simply add additional sausage or chicken. If you didn’t want to make the Alfredo sauce from scratch you could use a jar of Alfredo sauce. It’s completely up to you. This dish reheats well the second day so it is perfect to bring to lunch if you desire. All sorts of goodness come together in this one-pot pasta dish. Alfredo sauce, shrimp, chicken, smoked sausage, and more. Marinate chicken for about 1 hour in the Italian dressing. Discard the marinade after the marination has completed.Cook pasta according to box directionsIn a large pot heat butter, when the butter melts add the flour. Stir and cook for about 1 minute or until the roux begins to smell nutty. Add cream, parmesan cheese, mozzarella, and salsa. Stir to combine, and once the sauce thickens simmer until the sauce is needed.Add 1 tablespoon of oil into a large skillet over medium heat. Cook chicken for 5 to 7 minutes, or until done. Remove chicken. Add sliced sausage and sear. Wipe out skillet Sprinkle Tony Chassare seasoning on shrimp. Add another tablespoon of oil to the skillet and cook shrimp just until pink. Remove shrimp. Add oil if necessary, saute onion and green bell pepper and saute until the vegetables are tender.To assemble, combine pasta, meats, cooked vegetables with the sauce. Serve immediately. That sounds wonderful, I’m trying it tomorrow ! What can I substitute for the shrimp? Unfortunately I’m allergic to shrimp but I can eat other shellfish, go figure! I would just leave it out. You could add more sausage. Thanks, maybe I’ll use 2 types of sausage instead! This was good! My family didn’t believe me when I said I made it. I really enjoyed this dish, my kids finally cleaned their plates. PLEASE note the serving size for the nutrition information. I count carbs, and need to know what is the serving size; stating “per serving” is so inexact!!! I appreciate this, but this the recipe makes 6 servings, a thought could be to divide the final recipe into six equal portions. In the meantime, I will see if I can get the template redesigned, to allow for this to be put in. I understand it would make it much more helpful for someone. I appreciate your comment. I tried this recipe last night and was delighted as everything that went into it sounded great! Do you mean tony Chachere seasoning? When I goggled tony Chassare I only got a singer???? It is a brand of seasoning, it’s fairly common. Where do you buyTony Chassare Seasoning? Is there something else that’s similar? Tony’s is seen in almost every store in the South but you can buy it on-line. (try his dry roux mix, outstanding). Also look for Chef Paul Prudhomme’s brand or Zaterain’s brand. They will also pass muster! You can usually find this seasoning where the spices are in your larger grocery stores. I find it below the regular spices where the one of a kind spices are and seasoned salts and peppers are. This sounds so good and definitely a keeper. To bad we are invited out to dinner tonight otherwise it would been on the dinner table this evening. A silly question in the meantime, the Italian dressing is discarded upon completion of the marinate? You always throw out the marinade after using unless you put it in a pot bring to a boil and simmer 10-15 min. Raw chicken juice in the Italian dressing is a recipe for getting really sick! You are a braver man than I am, I generally toss the excess marinade. I believe that it works, I am more cautious in recipes that I write for others ;). Cheese Gumbo Pasta……..BRILLANT…….. If we didn’t have the whole Memorial Day menu planned, this would be on the table. Be sure we will make this next weekend. Let you know! Where does the 1 cup of Italian dressing come in? You marinate the chicken with the Italian dressing for about an hour before cooking in the pot. Looks absolutely delicious can’t wait to try it myself!